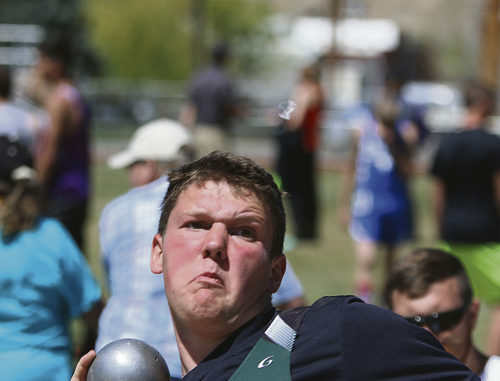 Rangely Panther Austin Ficken heaves the shot put for a first place finish at the Rangely Invitational. RANGELY I The Rangely Panthers hosted the Rangely Invitational meet on Saturday, April 22. Seven teams made their way to Rangely: Meeker, Caprock, North Park, Hayden, Little Snake River, Debeque and Grand Valley. The meet was smaller than what the Panthers head to every weekend but there was a lot of good competition on both the girls and boys side and it was nice not having to travel for a weekend. There were a lot of personal records by the Panthers but there was a new meet record set by Patrick Scoggins in the 800-meter run with a time of 1:57.31. The original record was set in 1981 by Southall from Steamboat Springs with a time of 1:58.31. This is also a new school record which was set by Scoggins last year of a time of 2:00.89. He also placed first in the 100-meter dash with a time of 12.02 and helped out on the 4×400. Senior Lindzey Thacker had a good meet. She high jumped, ran the 4×200, 400-meter dash and the 4×400. For the high jump she cleared 4 feet 5 inches for fourth place and she was able to place second with a time of 1:04.13 with a new personal record. Freshman Zoey Peck was busy doing the long jump with a jump of 12-01, running the 100-meter dash with a time of 14.77 to place eighth then running the 4×200 and 4×400. Miekka Peck did a wonderful job of singing the Star-Spangled Banner before competing in the shot and discus. She threw an 85-03 in discus and 26-03 for shot, placing seventh in both. 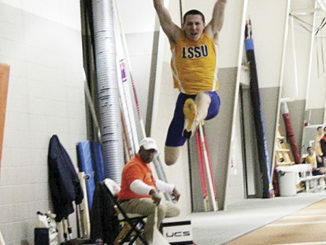 Phalon Osborn gave the 300-meter hurdles a try for the first time at the meet. She ran them in 56.08 for third place. She also ran the 100 hurdles with a time of 19.57 placing second. She also helped out in the 4×200 and 4×400. Raelynn Norman ran a lot at this meet. She ran the 1,600-meter, placing second with a time of 6:28.59, a new season record for her. She also ran the 3,200-meter run with a time of 14:14.89 placing fifth and setting a new personal record. She also helped out in the 4×400. Kaylee Mecham set new personal records in both of the throws. She threw a 23-06.75 in shot and 57-00 in discus. She also helped out in the 4×100. Jayleen Kenny threw the discus for the first time with a throw of 54-06 and then threw the shot for 22-10.75. Elena Forbes set a new personal record in both her throws also. For shot she placed ninth with a throw of 25-04.25 and 61-05 in discus. Senior Mikayla Filfred got a new personal record in the discus with a 82-04 placing eighth, then a 24-00.25 in shot and helped out in the 4×100. Chloe Filfred ran the 800, the 1,600 and the 4×100. In the 1,600 she took fifth place with a new personal record of 7:32.18 and fourth place in the 800 with a time of 3:27.06. Breanna Davis threw the shot for 30-10.75 for third place and in the discus she threw 66-11. She also helped out in the 4×100. Makenzie Cochrane was busy jumping, throwing and running. She gave high jump for a try for the first time in a varsity meet with a jump of 3-9 placing seventh. In the 100 dash she ran a 15.12 placing 10th. For throw she threw 29-05 placing fourth and 92-01 in discus also placing fourth. Katelyn Brown completed in her first meet of the season in the triple and long jump. She placed third in triple with a jump of 31-03.75 and then fifth in long with a jump of 14-05.75. She helped out with the 4×200. Marshal Webber set new personal records in all of his events. He placed second in the 110 high hurdles with a time of 18.05, second in the 300 hurdles with 43.91 and then fifth in the 200-meter dash with 26.18. David Fox, senior, placed fourth in the high jump with 5-05, then fifth in the long jump with a new personal record of 17-10. He also helped on the 4×200 and 4×400. Cameron Filfred stepped up and ran the mile placing ninth with a time of 6:14.80. He threw the shot for a distance of 32-04.25 and discus for 91-07 and helped with the 4×100. Austin Ficken was the one to beat in the throws, he placed first in both shot and discus. For shot he threw a 41-00.25, then for discus a 120-00. He also stepped up for the 4×200 and 4×100. Freshman Tytus Coombs tried triple jump for the first time with a jump of 29-00.25. He also long jumped a 15-08.25. He helped out on the 4×200 and 4×400. Riley Boydstun was able to help out in the 4×100 and 4×200 but throwing is where his heart lies. He threw the discus for 107-01 for sixth place then the shot for 29-09.25. Brady Bertoch improved in the shot and discus with new personal records in both. For shot he threw a 26-00 and 70-11 for discus. Senior Troy Allred placed second in the long and triple jump, first in the 400 and helped with the 4×400. He jumped 39-05.50 in triple, 18-07.5 in long and ran a 55.13 in the 400 which is a new personal record. The Panthers put together a total of six relays; three for girls and three for boys. The girls placed second in the 4×200 with a time of 1:58.47 with Osborn, Peck, Brown and Thacker; third in the 4×400 with Peck, Osborn, Norman and Thacker with a time of 4:55.69. Chloe Filfred, Mecham, Mikayla Filfred and Davis put the 4×100 together for a time of 1:11.14. On the boys’ side the 4×100 placed second with a time of 55.53 with Webber, Boydstun, Cameron Filfred and Ficken. The 4×200 also placed second with Coombs, Boydstun, Ficken and Fox. Placing third was the 4×400 with Allred, Coombs, Fox and Scoggins. The Panthers will be in Montrose next week on Friday, April 28. RANGELY I Even though Rangely High School was on spring break last week, the track and field team continued to practice and competed in Hotchkiss on Saturday.